Which thread is your favorite for a long arm machine? Thread: Which thread is your favorite for a long arm machine? I just purchased a HQ Sixteen sit down machine and would love any and all feedback about your favorite threads to use for long arm quilting and why! Thanks for your input! Wow. Thread preference depends ***so*** much on the individual machine, the individual quilter's preference, and even the individual quilter's style (dense quilting or pantographs). http://www.bobbincentral.com/glide.html . It never shreds or breaks on me, it does not stiffen the quilt even though I like to quilt densely, and it has a subtle shine that adds a little sparkle to my quilting. They probably have given you a recommended thread ... start with that and get to know your machine. Then branch out from there. There are still lots of threads I haven't yet but want to try. A lot depends on the type of quilting I am doing and personal preferences. I have many colors of Permacore thread and love it when I want the thread to really show. However, if I only want the texture to show or if I am doing lots of backtracking as in feathers or doing SITD, I love using So Fine #50 on top and Bottom Line in the bobbin. Another wonderful thing about using Bottom Line on bottom is the amount of thread you can get on a bobbin. 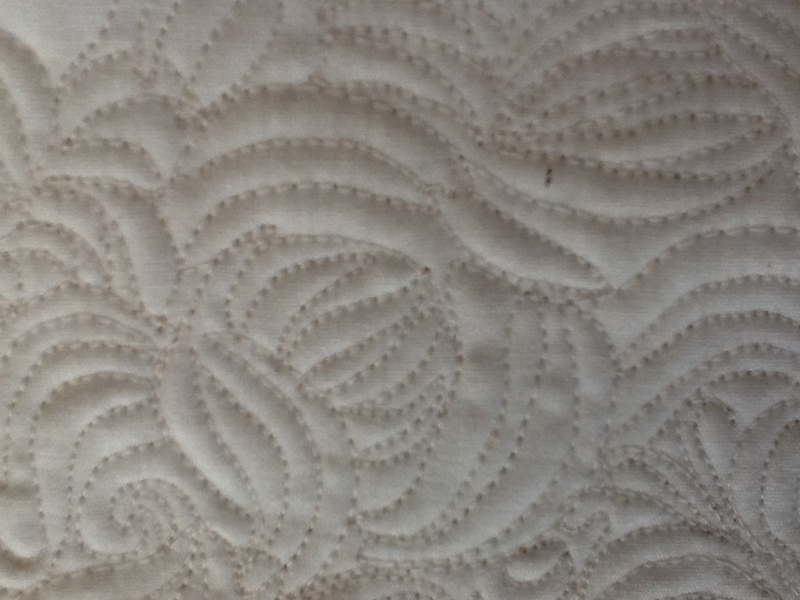 You can quilt so much longer before switching or refilling. I have also used So Fine top and bottom with great results. However, as I said, there are SO MANY MORE that I still want to try. Just try out different threads and you'll soon find your favorites, at least until you find new favorites! I love most of the threads made by Superior Threads although my machine is not fond of their 100% cotton King Tut. I also love Glide and Glide bobbins but shine is not appropriate for every quilt. Then Superior's So Fine is my Go To thread. Absolutely agree! Glide, along with magnaglide bobbins, is my go to thread of choice but like Laurlyn posted so much depends on the application. For lots of dense microstippling tiny fill quilting I like Invisifil and I am sure I would love silk but have not tried splurging on that yet. If I have something where I am going to have a lot backtracking and thread buildup I have used So Fine and been very happy with the results. Thread is like fabric, you want to branch out and try as many different ones as possible and not all threads are right for all applications. By all means Glide. But that being said, I recently used Bottom Line thread to do some McTavashing. It made beautiful stitches, looked like silk. I used in the bobbin and also for top thread. Many great threads out there, King Tut is my favoriate. Superior threads ... wonderful. I mostly use BottomLine (bobbin) and SoFine (top). My Nolting 24" PRO love those threads. I have a VERY old HQ16. I do not have a bobbin winder. I use Bottomline prewound bobbins and Connecting Threads Machine Quilting thread on the top (I think it is called Essnetial. I am VERY prolific for charity quilting and just cannot afford those lovely other type of threads. VERY inexpensive. Marketed as embroidery thread but works wonderful in a LA. Less expensive than CT essential and a much nicer thread IMHO. They also sell prewound bobbins but I don't think they offer them in the Jumbo M size. Not sure what the Sweet 16 uses. If it uses L size I would look into their bobbins as well. Thanks everyone- appreciate the input! When I "come up for air" from my machine, I'll try to keep you up on how I'm doing! Superior threads, call them they'll help advise you. First thing I did was order some of their thread charts. Also love Fil-Tec's Glide and their bobbins if you are looking for shine. Starting to not use so much variegated. It can disappear into matching colors on quilt top and look like a mistake. Superior's So Fine is one of my favorites. But as mentioned above it depends what your machine likes. I just got my Sweetsixteen and am having some tension problems. Doesn't using two different threads in too and bottom bother the tension?